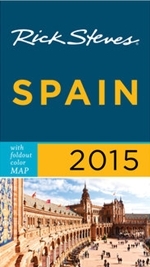 ← The Spanish Siesta: Fact, Fiction – or Envy? 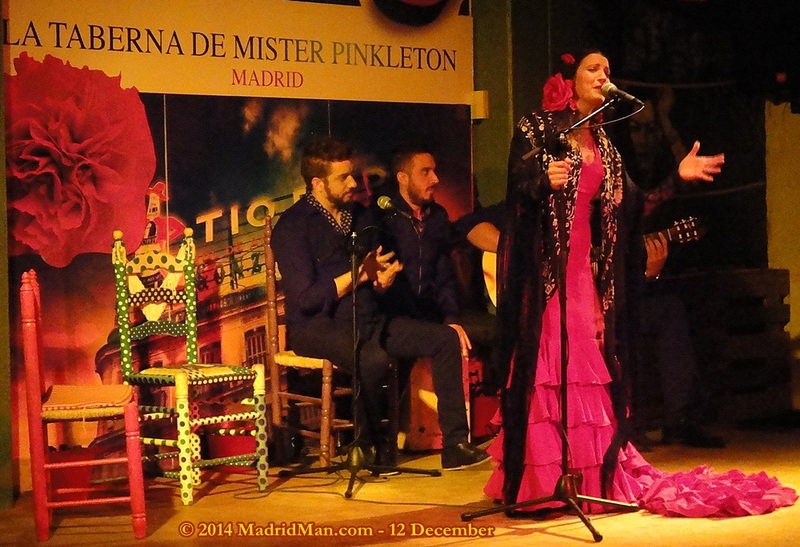 Last Friday night I had the distinct pleasure of watching Madrid Flamenco at La Taberna de Mister Pinkleton, located a few doors down from the “Arco de Cuchilleros” of the Plaza Mayor on the Calle de Cuchilleros, 7. Having walked past this place several times, I never thought much about it. 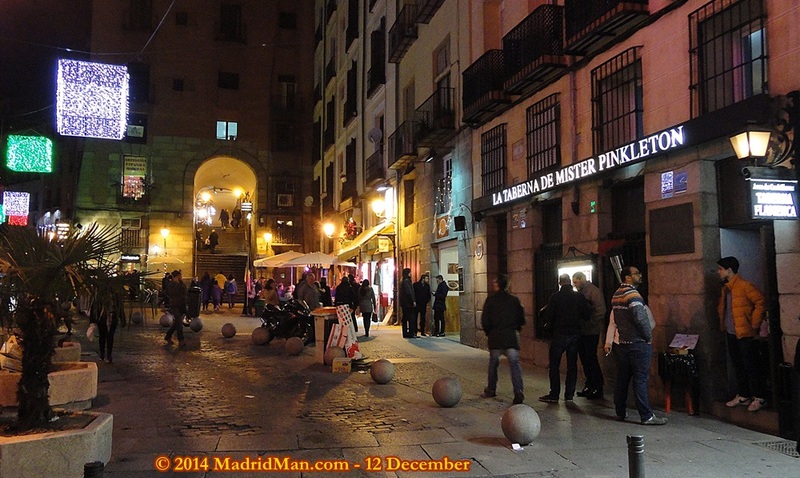 You know, one thinks (or at least I do), “It can’t be very good if it’s located in one of the most touristy places of Madrid.” And with a name like “Mister Pinkleton“? What’s that all about?? But names – and locations – can be deceptive; at least it was in this case. “Different” is the word I’d use upon this first impression. And while many people associate “different” as negative, it couldn’t be farther from the truth here. I’ve never seen, experienced a flamenco show in Madrid quite like this before. 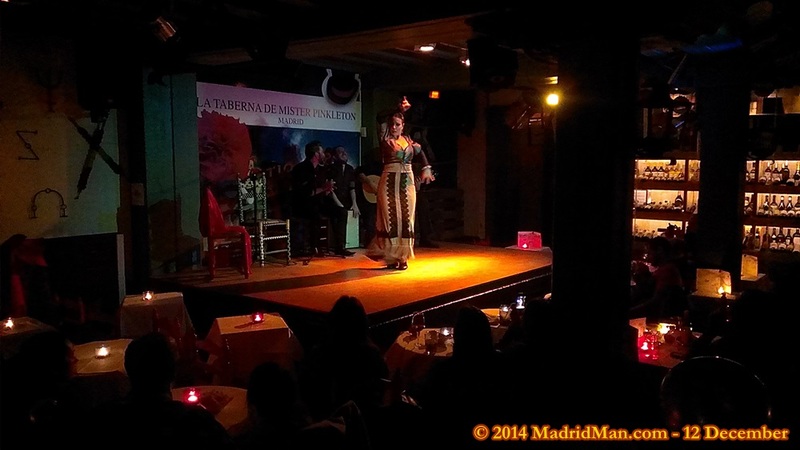 I’ve been to all the most popular flamenco tablaos in Madrid (except Casa Patas) more than once, and in a few cases a half a dozen times or more. Those who follow me know those to which I refer – and maybe you’ve gone with me! You arrive at the door of La Taberna de Mister Pinkleton and you’re greeted by a young man soliciting passersby to take in a flamenco show. I am somewhat reluctant to say (because the owners might read this), by all outward appearances, it looks like your typical tourist trap. But again, outward appearances can be deceiving. There are shows beginning at 7pm, 9pm, and 11pm. My tag-along and I had 9pm reservations and arrived a couple minutes late. Luckily, the show hadn’t started yet, but did at about 9:15pm. I’m guessing they don’t start on the hour so that people can be seated and order their food & drinks before the show gets underway. We were given a rather privileged table (see yellow arrow) on the 2-table upper level next to the windows and the view was excellent, being higher than the stage. The taberna/tablao isn’t big, which is a plus, and has about 25 strategically placed 2-person tables so that every table has a full-stage view. The waitress served us each a glass of wine. Mine was red Rioja wine and my tag-along chose the white Albariño wine. Both were very good. The wine came with two bowls of snacks, one with potato chips and one with mixed nuts. One drink is included in the very affordable 25 Euro admission price and the show lasted about 1 hour and 15 minutes – which took a 15-minute break in the middle. Considering the quality-price ratio, it’s a very good product for the price – and in a VERY central location. As I mentioned above, the show was “different“. It wasn’t all and only flamenco dancing. Just before the show started, the bilingual doorman jumped onstage to welcome the crowd in both English and Spanish – and some things he said surprised me. He said spectators could take photos and post them to Facebook and Twitter. He invited people to record video and post them to YouTube. He then proudly announced their high standing on TripAdvisor.com and encouraged everyone to rate & review the Taberna/Tablao. It appeared to be a young staff with very progressive ideas about how best to present and promote their product. These people are smart. They’re VERY clever. I was impressed. The flamenco group included a guitarist, a box player, a male singer, a female dancer, and a female singer who also danced (when she wasn’t singing). There was an initial number of just singing and music. Afterwards, the “show” included some interesting elements not normally seen in other flamenco shows. The female singer sang, “A Tu Vera” onstage (photo below), a “Copla” song Lola Flores made popular, although Concha Piquer sang it earlier (as did others). Later, the same singer sang another beautiful, slow “Copla” as she slinked through the tables, handing red carnations to a number of female spectators. This reminded me of a Fado show I saw once in Porto, Portugal, where the female singer sang without a microphone, walking through the crowd. Same thing here. She was very professional and quite moving, too. The two female dancers took turns dancing flamenco individually and later danced a “Sevillanas” together (see video below), one expertly twirled, then opened and closed a large fan. On this night there were no male dancers although I see from their website that they do sometimes perform. Then came a moment which quite possibly made some people uncomfortable. One of the female flamenco dancers started encouraging people to join her on stage and try a few flamenco moves. Some people take it well and enjoy the experience while others, well, might be put off. I know there was a moment of panic in me when I saw her scanning the crowd looking for “victims”. hehehe.. It was all in good fun and those who went up onstage seemed to enjoy themselves while we in the audience enjoyed watching normal people doing it, too – as long as it wasn’t us. The place opened as a tavern/tablao in 1961, but changed owners and name just two years ago. I haven’t gotten to the bottom of the origin of the name, but will try. Cool: Take a 360º look inside the Tavern via Google Maps Street View. The same “virtual tour” can be found at the bottom of the La Taberna de Mister Pinkleton website as well. This entry was posted in Entertainment, Flamenco and tagged Arco de Cuchilleros, Calle de Cuchilleros, dance, flamenco, flamenco show, Madrid, Mister Pinkleton, Old Town, plaza mayor, Taberna, Taberna de Mister Pinkleton, tablao, tablao de flamenco, Wine. Bookmark the permalink. Adding this to my list of “do next time in Madrid”. I know I queried the name of the taberna but the marketing is spot on. Thanks for an excellent review, MM. After 55 trips to Spain and as an experieced fluent teacher of Spanish after 41 years, this place is a joke! Thank you so much for your feedback, William!! Could you be a little more specific, please? 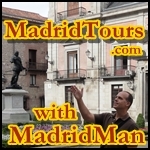 What places did you find better in Madrid?